Right at the very first verse of the Bible we see a phenomenon that separates the KJB from virtually all modern versions. The KJB translates shamayim as heaven and every modern version I could find renders it heavens. The Hebrew word is a “plural of majesty“, meaning it is a plural word intended to be used in the singular. For example, the queen might say, “We are famished.”, even though she is referring only to herself. Being royalty, she refers to herself with a plural. I suppose if the queen is royalty enough to use the term as a “majestic plural”, so is God when He speaks of His creation. There are other Bible words used the same way, such as Elohim, one of the Hebrew words for God. 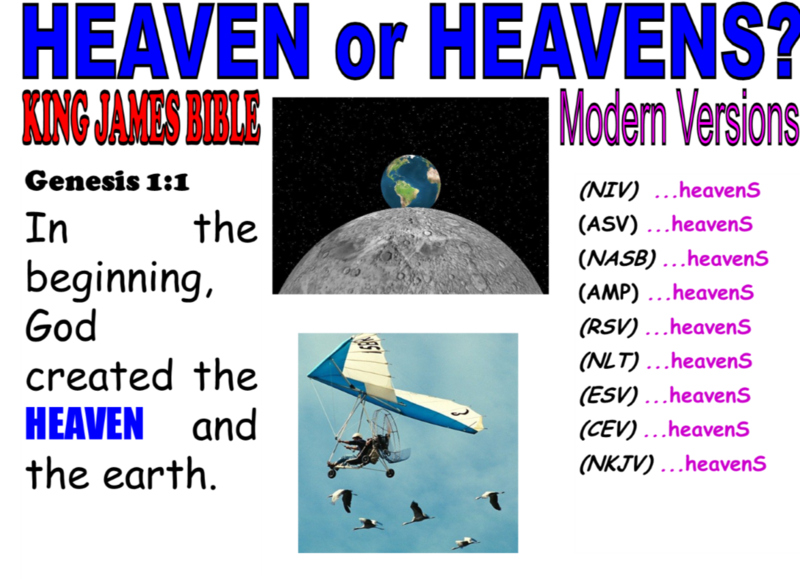 The other reason the KJB is correct is that, in the initial creation, God make one heaven and the rest of Genesis chapter 1 describes how He subsequently divided it into two heavens. One where the birds fly and the other where the sun, moon, and stars are. Later we learn the throne of God is in the “third heaven”. Thus, from the very first verse, we see the King James Bible is different than all the rest – and correctly so. (KJB) Gen 1:1 In the beginning God created the heaven and the earth. NRSV: In the beginning when God created the heavens and the earth. These modern versions are worded much more nebulously. They do not necessarily point back to the same “beginning” of the creation week where Adam and Eve were created (Matt 19:4, Mark 10:6). Adding “when” makes is possible for this to be a different beginning than the one in Mark 10:6. Putting “when” at the beginning, like the CEB version does, allows the creation to occur at anytime, not necessarily in the beginning at all. That could allow billions of years to exist before this creation. Adding “of” does the same thing. Which readings would evolutionists prefer? Mark 10:6 But from the beginning of the creation God made them male and female. Just so you know the Jewish publication society has a translation of the Torah where it is the singular “Heaven” also. Okay, that makes ONE out of over 1,000, but it’s one very few people even know about, let alone use. “Heaven” is correct. The Heaven is so named & defined in verse 8 as the “Firmament”. It is the divider of the waters above from the waters below (h2o). There is water above the firmament, not outer space. The sky is strong as a molten looking glass (Job 37:18), holding up the waters above (Psalm 148:4). God sits above these waters in the third heaven looking down on the circle of the earth (Isaiah 40:22), not the sphere of earth. The birds fly in the open firmament of heaven, so unless they breathe in outer space the firmament is the enclosed protective canopy over the spread out earth containing the sun, moon, stars, & atmosphere of air (otherwise wouldn’t the air escape & fly off into space especially on a globe spinning 67,000 miles an hr. around the sun as claimed by the world system. The reason the modern versions say “heavens” plural is because they follow science falsely so called & want to open up the firmament to a supposed infinite outer space where everything is relative (humanism) & there is no real “up” or “down” , making the Word of God seem void / outmoded in it’s cosmology helping the mockers & skeptics. It generates confusion but God is not the Author of confusion. Something to consider, food for thought. I believe the AV translators did this because they understood there was a GAP between Gen.1:1 and Gen.1:2. They realized that the 6 days of God restoring the earth and heaven begins in Gen.1:3. Therefore when God divides the waters He then refers to each division as heaven. Collectively He refers to them in the plural (Gen.2:1). The firmament would be all of what we call outer space and our earth atmosphere (firmament). That puts the waters above the firmament at the end of the cosmos (Gen.1:7). God also restores order to the sun, the moon and the stars in the firmament (Gen.1:14-18). I don’t believe there has to be a gap for it to be an accurate translation. With or without a gap, God goes on to separate the heavenS from the heaven in the rest of the chapter. I might add. Heaven in Gen.1:1 we would assume to be God’s and the angels’ domain. When God made this division between His domain and the firmament, it is the only day that He did not say “it was good” (Gen.1:6-8). It’s also the only day nothing was actually created, so there was nothing that hadn’t already been declared “good” and nothing that needed to be declared “good”. What was previously created had already been declared “good”, and the entire week was called “very good”. Derek R’s insight is important to understanding Genesis 1. This Chapter is the story of the creation of human autonomy, or free will. God has no personal use of man’s free will but it is vital to our experience of our existence and our quest to know Him. As Derek points out, after Day 2, it was not said of the creation of the vault that it was good. Importantly, however, He also did not say that it was bad. If the vault was only bad, this chapter would have called that out since good is mentioned so repeatedly (7 times). Free will is neither good nor bad. Our autonomy is, however, always subjective; i.e. we get to decide what is and what is not real and that decision can be either a good or a bad one. Now, revisit the first creation day. The same pattern of omission is observed wherein, God sees that day, or light is good and then he goes on to create the night with no determination of good or bad i.e. God also does not say that night was good. God is light. Our mission is to know him. We have the option, however, to choose not to know him. Next, pay close attention to “And there was evening, and there was morning”. This phrase repeats 6 times and every time it repeats after God has already declared His creation of that day to be good. They are therefore also neither good nor bad in and of themselves; that is our call to make. Evening and morning are neither night nor day. They’re the hazy middle between the two; are the confusion of the faithful or the fearful, who cannot fully decide, one way or the other. This indecisiveness is judged by the repetition of that phrase 6 times. 6 is God’s number for those human decisions in which we do not decide to submit to His perfect love. Now, let’s revisit Day 2 and the vault. It is in our atmosphere in which we find the light (during the day). It’s a problem that has confounded scientists forever that the sky beyond our atmosphere is not light (called Olbers’ Paradox). That problem, however, isn’t, in fact, such a quandary. From our vantage point on earth, we are subject to Einstein’s theory of relativity as result of earth’s rotation and its resulting gravitation. Relativity is complex but its application here is simplified by its axiom; the equivalence principle, which states that energy is equivalent to mass and therefore subject to gravity. On earth then, we observe light within Earth’s gravitational field or, within the vault during the day while on the earth. At night, the vault does not display light thanks to the wave nature of light emitting from our sun and so, we have dark night. In the darkness, humans decide for themselves what is real and what isn’t – we get to choose to know God or to reject Him. The other elements of the creation were made so that we can find Him in them and make the righteous decision to know Him. The most informative knowledge and significant is that of Gen.1:1 that the father is the only God there is no other not one ! If Christianity could get back to basics and understand that Jesus is the actual literal son of this singular God and father and creator of all.